Momentum strategies perform well on the set of stocks included in the DJIA index. A portfolio made up of 21 stocks that were part of the DJIA index in 1988 beat the S&P 500 index by 6.37% annually from 1988 to 2019. The optimal timing period of the momentum strategy has changed from 12- month from 1988 to 2002, to 6-month from 2003 to 2007, and 3-month from 2009 to 2019. With a long-term investment horizon, the momentum strategy was profitable and could sustain a high level of income for retirement accounts. The profitability of momentum strategies was first demonstrated on large portfolios investing in hundreds of stocks. Those kinds of portfolios can be managed only by large financial institutions. Individual investors do not have the funds necessary to profitably apply momentum strategies to a large number of assets. Because of this limitation, many authors on Seeking Alpha, developed momentum strategies for small sets of ETFs, or mutual funds. Some Seeking Alpha contributors concluded that momentum strategies are not suitable for small universe of individual stocks, due to their high volatility. Here is a link to an article that considered this question. We also tried to apply a momentum strategy to a portfolio of the AAII Chicago South Suburban chapter. Our results were disappointing, with alternating periods of high returns and high losses. Our conclusion was that momentum strategies were not suitable for our particular portfolio. In this article we show that momentum strategies may perform quite well for well-selected sets of assets. Instead of considering large stock universes, we restricted the set of stocks to a small set of stocks with very similar characteristics. A natural choice is to select stocks from the DJIA index. The DJIA index changes in time by replacing some stocks when they no longer meet the criteria for belonging to the index. The changes are not very frequent: there were 25 stocks replaced in the 1988 – 2018 time period. From the original 30 stocks in 1988, 13 are still in the index today. Another 8 stocks were dropped, but they still trade on a US exchange, and 8 became private companies. Contemporaneously, a momentum strategy could always use the stocks in the index, and so the survivorship bias is not a concern. With a good historical database of stock prices, one can backtest the momentum strategy on the set of stocks in the index at any time. Unfortunately, we do not have access to such a database. For that reason, we chose to perform a back test of the strategy on the 21 stocks for which we have historical prices over the entire period from 1988 to 2019. List of stocks that have been in the DJIA index continuously since 1988: American Express (AXP), Boeing (BA), Coca-Cola (KO), DowDuPont (DWDP), Exxon Mobil (XOM), International Business Machines (IBM), Johnson & Johnson (JNJ), McDonald's (MCD), 3M Company (MMM), Merck & Co. (MRK), Pfizer (PFE), Procter & Gamble (PG), United Technologies (UTX). List of stocks that have been in the DJIA index in 1988, but were dropped since, but continue to be public companies listed on a US exchange: Citigroup (C), General Electric (GE), Goodyear Tire & Rubber (GT), Honeywell International (HON), International Paper (IP), Altria Group (MO), Navistar International (NAV), AT&T (T). As in our previous articles, we decided to use Portfolio Visualizer [PV], a free software application. In those articles, the portfolio was managed with a Tactical Adaptive Allocation strategy. Portfolio Visualizer has three portfolio allocation strategies based on price momentum: Relative Strength, Dual Momentum, and Adaptive Allocation. Either one may be used. In this paper we use the Relative Strength strategy. The PV link to our simulation model is here. The relative strength strategy has two parameters: (1) “performance timing period” and (2) “number of assets to hold,” which should be set by the user. For the timing period we experimented with the following values: 3, 6, 9, 12 and 15 months. For the number of assets we considered all integers from 1 to 10. We found that the optimal timing period changes over time. Initially, starting in 1988, the optimal timing period was 12 months, consistent with the value published in most academic articles about momentum. Between 2003 and 2007 the optimal period was 6 months, and from 2009 on, the optimal period has been 3 months. The optimal number of assets to hold is 6. The strategy has a simple rule: rank the 21 assets by their total returns over a specified performance interval, and invest all the funds equally divided among the 6 best-performing assets. The trades are executed at the market closing of the last trading day of the month. The simulation covers 31 years, from January 1988 to February 2019. In this article, only a small fraction of the results is presented and discussed. The interested reader can see the full results on the model’s PV link. Here are some performance metrics of the strategy with a 12-month timing period: Compounded Annualized Growth Rate [CAGR] is 14.58%, the maximum drawdown [MaxDD] is -33.78%, the worst year is -21.33%, and the Sharpe Ratio is 0.75. For comparison, a portfolio invested equally in the 21 assets, rebalanced annually, had the following results: [CAGR] is 13.00%, [MaxDD] is -54.11%, the worst year is -38.06%, and the Sharpe Ratio is 0.67. The Vanguard 500 ETF had the following results: [CAGR] 10.37%, [MaxDD] 50.97%, the worst year return -37.02%, and the Sharpe Ratio 0.56. The graphs of the equities of the three portfolios are shown in the figure below. All the figures in this article were generated by the PV application. Below are the annual returns. Here are a few observations drawn from the annual returns graph. The momentum strategy had 5 years with negative returns: 2001, 2002, 2008, 2017, 2018. The equal weight strategy had 6 years with negative returns: 1990, 2001, 2002, 2008, 2015, 2018. Since 2009, the momentum strategy underperformed in 8 out of 11 years. The performance of the momentum strategy over the period from 2009 on, would improve significantly if the timing periods were set as 3 months. Over that period, the momentum strategy with a 3-month timing period performed better than the equal weight strategy in 8 out of 11 years. In Table 1 we show the performance of the timing strategy with 12-month and 3-month timing periods, along with an equal weight strategy and the market benchmark of the S&P 500. The “Timing Combined” line assumes that from 1988 to 2008 the timing period was 12 months, but starting with January 2009 the timing period was 3 months. Table 1. Performance of the strategies over the 1988 – 2019 period. In this section we analyze how this portfolio would have performed if it was applied mechanically by an investor in retirement. We assume that the investor started with $100,000 in January 1988, and decided to withdraw 8.0 % (adjusted for inflation) of the portfolio balance at the end of each year. 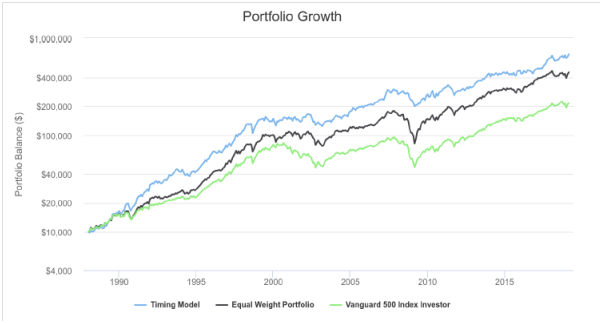 We compare the momentum strategy with the equal weight, rebalanced annually, and a benchmark represented by VFINX, the Vanguard 500 Index Investor. The graphs of the balance of those portfolios are shown in the figure below. From the graphs we can see that the momentum portfolio ends up with a balance substantially larger than that of the equal weight portfolio, which on its turn ends up with a balance much larger than that of the market benchmark. The momentum portfolio shows a much higher balance than the benchmark over the whole period of time. 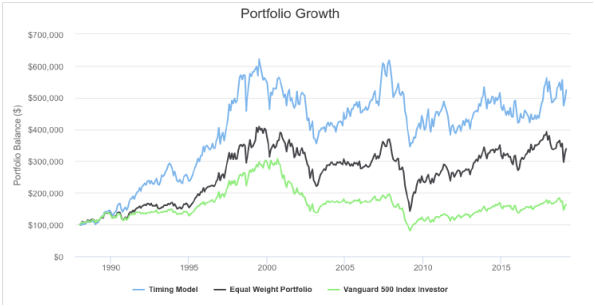 The investor using the momentum strategy was able to withdraw much larger amounts of cash every year from 1989 to 2018, and ended up with a balance three times the balance of the benchmark portfolio. To better appreciate the differences in performance we show some numbers in the table below. Table 2. Portfolios performance and withdrawals over the period from 1988 to 2018. Going forward, for a long time horizon of at least 5 years, the DJIA portfolio with tactical asset allocation based on momentum will, most likely, outperform the US equity market. The momentum strategy can be easily applied with minimum effort. On the last trading day of each month, the investor has to rank the 30 stocks in the DJIA index by their total return over the last three months and allocate equally all the money to the 6 stocks with the highest return. To apply the simple portfolio successfully, the investor needs to exercise patience and to accept that there may be periods when the strategy underperforms. Based on the observed behavior of the strategy, we expect that any underperformance will be minor and of short duration. The investor should monitor the performance of the strategy for various values of the two parameters, timing period and number of stocks to invest in. Momentum strategies were shown to perform well for the stocks in the DJIA index, contrary to the results obtained with many other small sets of stocks. We believe that this behavior is due to the fact that the stocks in DJIA exhibit some desirable characteristics that were not common to other sets of stocks. All DJIA stocks are very large cap, and have lower price volatility than the average stock. One should not expect that the performance of the US market and of the portfolios presented in this paper will continue in the near future. Also, the fact that the momentum allocation underperformed in some years did not make the strategy unprofitable over the long run. Periodical underperformance of the strategy is unavoidable and should be expected. An obvious solution to mitigate the impact of underperformance periods is to allocate only a portion of the money to a single strategy. 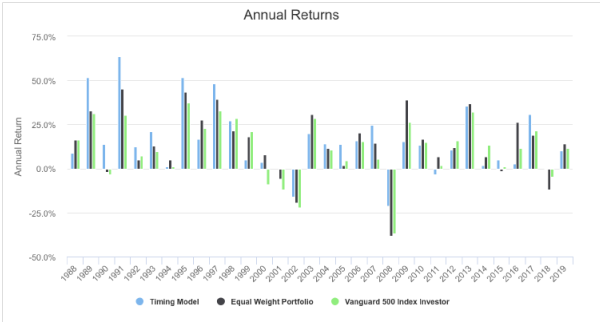 For this portfolio, the volatility of the returns can be decreased by investing, for example 50% into the momentum strategy and 50% into the equal weight portfolio. One can vary the ratio to reflect one’s expectations. Additional disclosure: The article was written for educational purposes and should not be considered as specific investment advice.